Recently, a friend of mine that is one half of the wonderful screen and letterpress shop, Cricket Press, down in Lexington, Kentucky, was kind enough to print some business cards for me. She did it for trade ( I love barter!). 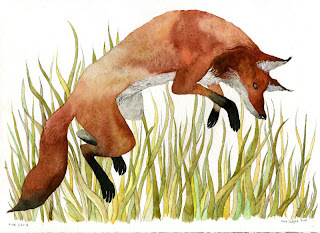 Sara loves red foxes, and so requested a watercolor. This one is caught in mid pounce. Several years ago I was on San Juan Island in the Pacific Northwest. We were hiking about the southern tip of the island in a park that was overrun with a feral rabbit population. The bunnies were introduced by US soldiers that used the area as a military base in the 19th(?) century. The park is known as "American Camp". It is an excellent place to watch for orcas and dolphins come through the strait. Some years ago, red foxes were introduced to control the rabbits. I can confirm that both rabbit and fox are doing just fine. The foxes seemed to have plenty to eat, yet it was not readily apparent that they were making any substantial dent in the bunny population. I stood on a hilltop as the sun was setting over the strait, surrounded by dozens of rabbits. A fox made an appearance and casually strolled amongst its prey. The rabbits seemed totally unfazed by its presence. On the drive back to our bed and breakfast, we saw at least five more foxes roadside. Oh, lovely! Nice pounce! I really like how the watercolor spread out and looks like fur. Our foxes down this way have such multicolored fur they look almost green to me. Cunning tricksters!